All in all I think this is the best plan I have come up with and it eliminates some of the "S Curves" in previous designs. 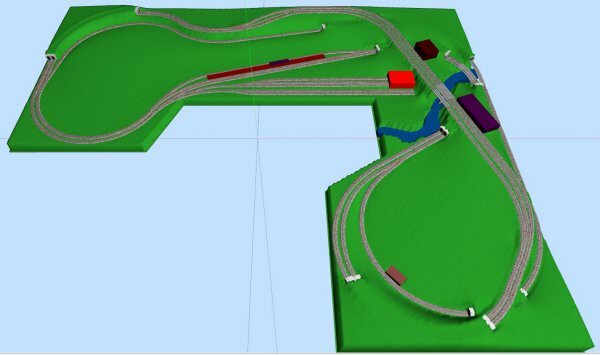 The omission of those curves allows for some longer straights for the freight side and the addition of the 3rd (inside) line will accommodate the curvy tourist/dinner line for my Pacific 4-6-2 and passenger cars. The inclusion of the engine house has also made me look at a small siding/yard for that area. It doesn't really serve any great purpose other than some where to park trains but adds a little interest and gives me the chance to do some detailed scenery work around the Shop and Yard. Looks good! Should be lots of mainline running on that line! Hope so, one double main with a secondary "tourist line". Not sure how much work the "little yard" will get, probably not too much as not too much can done with it I don't think. It's mainly there for effect. This is going to be a great looking layout Tony! looking forward to following along with this build! I am a little confused ... Will the "three track" portion be raised, or the other part? Thank you and I am looking forward to getting it started ... it's been TOO long in the making. Are you using benchwork from a previous layout, or are you starting from scratch? Starting from scratch everything new from the ground up. The old layout bench work isn't big enough for this layout, albeit by only a few inches in some cases, and doesn't include the right hand extension. The old bench work is a table top type as well so I would have needed to "rip up" the ply that was on that which would have taken more time and effort than it was worth. I am also raising the hieght of the bench work by a couple of inches for this one. Even though I have a bit of wood from the old layout, it is going to be easier and quicker to start from scratch. Like the plan Tony. The additional tracks will be good for storage and add some interest. The tourist train is also an interesting idea. Waiting to see the build. Thanks Chet, that means a lot. I am a "maximum amount of track for the space" kinda guy; however, that track MUST be purposeful and NOT just for the sake of more track. 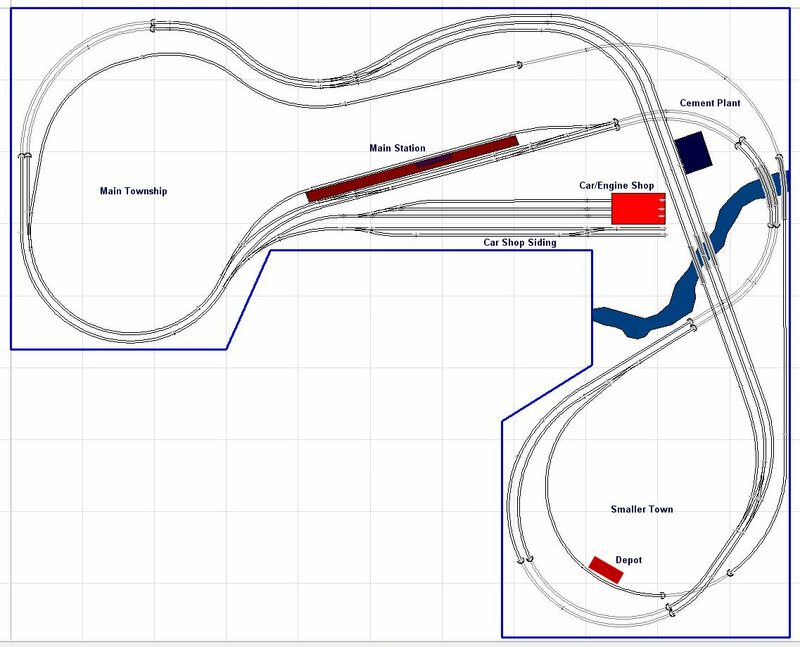 The "3" Track section is to be used as an "overtaking" track (the centre track) and can be utilized as a "storage track" as well, along with the small spurs at the front of the layout. If I go ahead with the Cement Plant thought, the far right track, of that 3 track section, will become the Cement Plant Track track and the inner two tracks will revert to the double main line through tracks. Going that route will mean pushing that far outside track out a little further to accommodate the Cement Plant Loading Tower. Obviously, that will mean loosing the passing track. Love th3 elevated track and tunnels. No doubt you will have access in to the tunnels. What software are you using? AnyRail? Thank you and the software is the paid version of SCARM. My intention for the tunnels is to have "lift offs" where possible for access and some area from beneath them as well. Anticipated start date: 27th July!!!! Happy wife happy life, looking forward to your progress. Looks like a lot of fun. Looks very nice and tidy! Looking forward to the start Tony! How's it going mate, haven't heard from you, hope all's okay? Thank you and I am looking forward to getting it started. I think this will be a long process though, I didn't make it all that straight forward with grades and levels BUT, it should be fun I think. All good here. Streamlining the track plan is paying dividends indeed. I did spend a LOT of time in trackplanning on my own and it was worth it (and enjoyable). It looks very nice and flowing and echoing what Chet said, i like the added tracks where the car shop is. Making the cement plant rail-served might be worth it as mentioned earlier on at the cost of losing the 3rd passing track (imho). You can get a variety of different cars to/from the cement plant.